No adapters found in environment. Performing global finalization only. It turned out in our case that the task sequence was failing to join the domain because the network adapter was too slow to respond after the reboot. I’m not sure if this is due to the T7600’s dual network adapters or some other reason, but so far this is the only model that has shown this behavior in all the years we’ve been using SCCM. In addition, the problem is intermittent and does not always happen – sometimes the machines do succeed in joining AD. This entry was posted in SCCM on February 12, 2018 by Boris Kagan. I was recently tasked with putting together a GPU mining setup for a client with a $1500 budget and certain requirements. I am sharing the component list used for the build here so that anyone else with a similar budget and similar requirements can have an idea of what to select for their system. This build allows for expansion of up to 6 total graphics cards. If your budget is lower, you can opt for a cheaper motherboard with less PCIe slots, a cheaper power supply with less wattage capacity, and maybe a different case. Also keep in mind that there are better and higher quality components available, but for a higher price. This setup can be used to mine Ethereum (ETH), Monero (XMR), Ethereum Classic (ETC), Zcash (ZEC), and any other cryptocurrency that uses a GPU mining algorithm. This entry was posted in Hardware on January 31, 2018 by Boris Kagan. 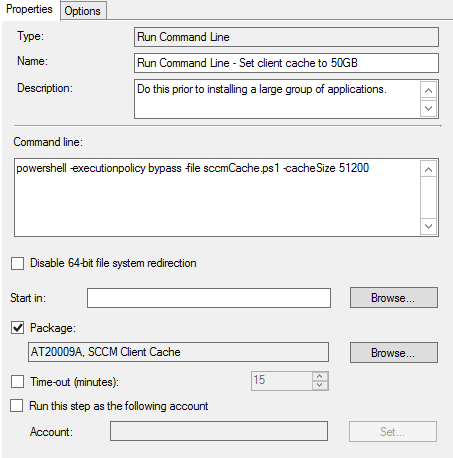 In the past I posted how to configure or clear the SCCM client cache using Powershell scripts, but that method required a separate script for each cache size you might want to set. This new script allows on-the-fly modification of the CCM Cache from a task sequence using a single SCCM package containing this new Powershell script. To use this script, you will need to create a package in SCCM with the source contents containing this script. You do not need to create a program for the package. Make sure the package can be used by task sequences without being deployed. After distributing the package, just call it from a task sequence using a “Run Command Line” step referencing the package. This entry was posted in PowerShell, SCCM on October 23, 2017 by Boris Kagan. I created this script for use with SCCM to allow easy creation of shortcuts during deployment for applications that do not create their own shortcut, or for portable applications that are not actually installed. The powershell script can be called upon from the “Run Command Line” step of a task sequence, and the script should be added as a Package to SCCM so that it can be referenced from the Package option inside the Run Command Line step. This script generates shortcuts in the Public Desktop and the Start Menu. If a drive letter is specified in the path, it will be used. If no drive letter is specified in the path, the $env:SystemDrive variable will be used to figure out the drive letter based on the OS drive. If a URL is specified in the path, it will be used instead of a local path. powershell -executionpolicy bypass -file generateShortcut.ps1 -name "Shortcut Name" -path "D:\test.txt" powershell -executionpolicy bypass -file generateShortcut.ps1 "Shortcut 2" "Users\Administrator\Desktop\test.txt" powershell -executionpolicy bypass -file generateShortcut.ps1 -name "Shortcut to Google" -path "https://www.google.com/"
powershell -executionpolicy bypass -file generateShortcut.ps1 -name "Shortcut Name" -path "D:\test.txt"
powershell -executionpolicy bypass -file generateShortcut.ps1 "Shortcut 2" "Users\Administrator\Desktop\test.txt"
powershell -executionpolicy bypass -file generateShortcut.ps1 -name "Shortcut to Google" -path "https://www.google.com/"
This entry was posted in PowerShell on September 29, 2017 by Boris Kagan. I recently had to encrypt a Microsoft Surface Pro 4 using Bitlocker, and in our environment that means backing up the key to Active Directory. However, after the Surface was encrypted, running the “manage-bde -protectors -get C:” command showed it only had a TPM PCR Validation Profile, and was missing the Numerical Password ID that would be necessary in order to run adbackup on the protector. This was on Windows 10 Enterprise 1607. When trying to add a new protector using the -RecoveryKey switch, there was an error saying “No pre-boot keyboard or Windows Recovery Environment detected. The user may not be able to provide required input to unlock the volume.” What’s even more puzzling is that this error occurred on just one of the Surface Pro 4’s, and the second one encrypted without a problem and had a Numerical Password ID as it should. As it turns out, this error message means the computer has no physical keyboard during pre-boot (even if the physical Surface keyboard is attached) even though that doesn’t matter for us since we’re not using a TPM pin to unlock the device. This entry was posted in Miscellaneous on April 5, 2017 by Boris Kagan. SCCM’s power configuration options allow setting a wakeup time for computers, but only for desktops. Currently SCCM has no option to enable wakeup for laptops. The idea behind this is that a laptop can be in a bag and so should not be woken up automatically, but it would still be nice to have an option to enable this if you know for sure that your laptops will not be inside a laptop bag during the wakeup time, such as laptops used in lab environments. Setting a wakeup time for laptops can be accomplished with a PowerShell script and a Task Scheduler task. This can be deployed with SCCM as a package targeting your laptop collections. This entry was posted in PowerShell, SCCM on March 7, 2017 by Boris Kagan. If you need to clear the SCCM client cache or increase the cache size on individual clients, there are a few different ways to do it. One of the methods usually posted on a lot of blogs and forums is actually the wrong way to do it, because it requires restarting the CCMEXEC process on the client in order to update the new cache settings, which makes the task sequence used to deploy the script fail since CCMEXEC, which was running the deployment, has been terminated. Here I will show you the right way to clear the CCM cache that does not require restarting the CCMEXEC process. This PowerShell script can be deployed with SCCM as a package or as part of a task sequence. Sometimes this method is preferable to using Right Click Tools, especially if you want to only change cache settings during application deployment, such as part of a task sequence that installs multiple large applications. Sometimes it doesn’t make sense to keep 30GB of installers cached on the computer and it’s better to just manually flush the cache after the installation completes. This entry was posted in PowerShell, SCCM on February 20, 2017 by Boris Kagan.